The main components of the Power Unit are the PSA ( Power Supply Asic) and the CHAPS ( Charger Power Switch ). In normal operation the baseband is powered from the phone's battery. 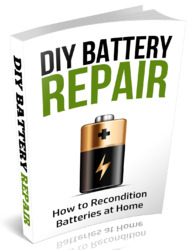 The battery consists of three Nickel Metal Hydride cells. 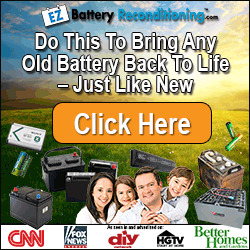 There is also a possibility to use batteries consisting of one Lithium-Ion cell. An external charger is used for recharging the battery and supplying power to the phone. The charger can be either a standard charger that can deliver around 400 mA or a so called performance charger, which can deliver supply current up to 850 mA. The baseband contains components that control the power distribution to the whole phone excluding those parts that use continuous battery supply. The battery feeds power directly to three parts of the system: PSA, RF-power amplifier, and UI (buzzer and display and keyboard lights). The power management circuit CHAPS provides protection against overvoltages, charger failures and pirate chargers etc. that could otherwise cause damage to the phone. Watchdog counter reset "1" -> "0"
Charger Current Measurement over the shunt resistor. M2BUS data output, PSA M2BUS output is in high-Z state. Acceptable chargers are detected by the software. The absolute maximum input voltage is 30V due to the transient suppressor that is protecting the charger input. At the phone end there is no difference between a plug-in charger or a desktop charger. The DC-jack pins and bottom connector charging pads are connected together inside the phone. The charging block diagram is below. charging to a phone with an empty battery. The startup circuit charges the battery until the battery voltage level reaches 3.0V (+/- 0.1V) and the PSA releases the PURX reset signal and program execution starts. Charging mode is changed from startup charging to PWM charging that is controlled by the MCU software. If the battery voltage reaches 3.55V (3.75V maximum) before the program has taken control over the charging, the startup current is switched off. The startup current is switched on again when the battery voltage has decreased to 100mV (nominal). Output overvoltage protection is used to protect phone from damage. This function is also used to define the protection cutoff voltage for different battery types (Li or Ni). The power switch is immediately turned OFF if the voltage in VOUT rises above the selected limit VLIM1 or VLIM2. The voltage limit (VLIM1 or VLIM2) is selected by logic LOW or logic HIGH on the CHAPS (N101) LIM- input pin. Default value is lower limit VLIM1. When the switch in output overvoltage situation has once turned OFF, it stays OFF until the the battery voltage falls below VLIM1 (or VLIM2) and PWM = LOW is detected. The switch can be turned on again by setting PWM = HIGH. Output overvoltage protection is also needed in case the main battery is removed when a charger connected or a charger is connected before the battery is connected to the phone. With a charger connected, if VOUT exceeds VLIM1 (or VLIM2), the CHAPS turns switch OFF until the charger input has decreased below Vpor (nominal 3.0V, maximum 3.4V). The MCU software stops the charging (turn off PWM) when it detects that the battery has been removed. The CHAPS remains in protection state as long as the PWM stays HIGH after the output overvoltage situation has occurred. 3. VOUT falls (because no battery) , also VCH<Vpor (standard chargers full-rectified output). When VCH > Vpor and VOUT < VLIM(X) -> switch turned on again (also PWM is still HIGH) and VOUT again exceeds VLIM(X). When a travel charger (2- wire charger) is used, the power switch is turned ON and OFF by the PWM input when the PWM rate is 2Hz. When the PWM is HIGH, the switch is ON and the output current lout = charger current - CHAPS supply current. When PWM is LOW, the switch is OFF and the output current lout = 0. To prevent the switching transients inducing noise in audio circuitry of the phone soft switching is used. The performance travel charger (3- wire charger) is controlled with PWM at a frequency of 32Hz. When the PWM rate is 32Hz CHAPS keeps the power switch continuously in the ON state. Charging current is 1000 mA. Different battery types are identified by a pull-down resistor inside the battery pack. 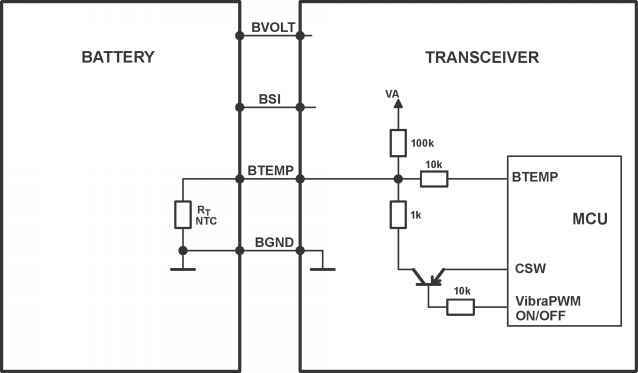 The BSI line inside transceiver has a 22k pull-up to VA. The MCU can identify a battery by reading the BSI line DC-voltage level with a MCU (D201) A/D-converter. The battery temperature is measured with a NTC inside the battery pack. The BTEMP line inside transceiver has a 100k pullup to VA. The MCU can calculate the battery temperature by reading the BTEMP line DC-voltage level with a MCU (D201) A/D-converter. Based on 47kQ ± 5 % NTC with B = 4090 ±1.5 %. Without any alignment, with that and 1 % pull-up resistor, ± 2.5 °C accuracy is achieved between - 20 and +60 °C (± 3.5 °C @ -40 ... +85 °C). A vibra alerting device is used for giving silent signal to the user of an incoming call. The device is not placed in the phone but it will be added to a special battery pack. The vibra is controlled with a PWM signal by the MCU via the BTEMP battery terminal. Battery size indication Phone has 100kohm pull up resistor. The heart of the power distribution is the PSA asic. It includes all the voltage regulators and feeds power to the whole system. The baseband digital and analog parts are powered from the VL and VA regulators which provide the 2.82 V baseband supply. The baseband regulators are active when the phone is powered on. The PSA includes also two 2.82 V regulators (VRX and VTX) providing power to the RF section. These regulators can be controlled by the direct control signals from the MCU. The VRX regulator can also be controlled by the signal from the NASTA. - Buffer for the M2BUS. 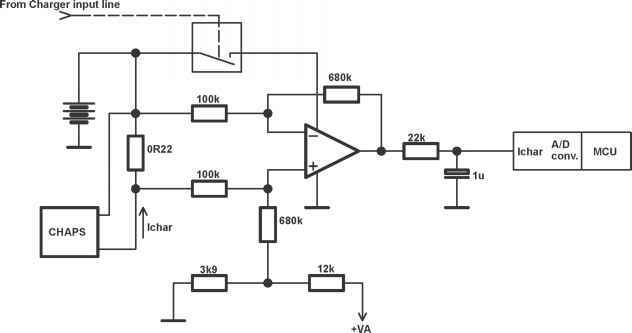 The buffer translates the logical input signal to open-drain output. - Power on/off and reset logic. The Power off logic can be used as a watchdog. - Supply voltage monitor and automatic reset/power-off. VBATSW is internally divided and buffered battery voltage output. The A/D -converter input monitoring the battery voltage can be connected here. The circuit monitors the voltage at the VBAT input and forces the circuit to Reset if the voltage level is below allowed limit voltage, VBATcoff-. A hysteresis is included to prevent oscillation between different states. 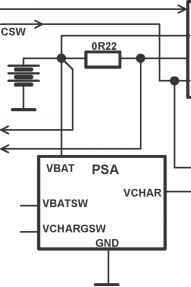 Externally divided charger voltage VCHAR goes through PSA internal switch to VCHARSW output. The A/D -converter input monitoring the charger voltage can be connected here. - On-chip thermal shutdown, which protects PSA from overheating. Thermal shutdown includes hysteresis in order to prevent oscillation during the thermal protection. Note 1: Voltage deviation (AV) is the output voltage overshoot in transient response. Recovery time (Tree) is the time from the beginning of the transient response to the time point when the regulator output voltage first crosses the final stable value after overshoot. Note 2: Settling time is defined from the time point of mode change Power-Off to Reset to the time when regulator output voltage is within 5% of the final value. Note 2: Settling time is defined from VTX_ENA/VRX_ENA rise to the time when regulator output voltage is within 5% of the final value. The circuit has three operational modes: Power-Off, Reset and PowerOn. The additional modes are the Protection mode and Battery disconnected (VBAT < VRth, master reset threshold). Respective conditions of the external signals are described in the NO TAG. NOTE: VBATSW and VCHARSW are controlled by internal VSW_ENA-signal during power-on. NOTE: PWRONBUFF is an inverted (and buffered) PWRONX. A logic LOW level at PWRONX (active LOW) will force a logic HIGH level at PWRONBUFF. In order to be in Power-Off mode VBAT must be above VRth. During Power-Off mode PURX is at logical low level. VA, VL, VRX and VTX regulators are disabled and in high-Z low output state. The PSA contains a watchdog counter that is reset by writing "1" - "0" sequence to input PWROFFX. " The circuit goes to Power-off mode from Power-On after delay Toff if watchdog has not been reset during this time. The other possibility to enter the Power-Off is from Reset, if the PSA can not enter Power-On mode because VBATcoff+ is not reached. This means that watchdog elapses before the microcontroller is able to produce a pulse to PWROFFX. If charger is present (VCHAR>VCHARth), transition from Reset to Power-Off can not occur but the circuit stays in Reset mode as long as battery has been charged above VBATcoff+. The circuit goes to battery disconnected mode if battery voltage drops below master reset threshold (VRth-). For testing purposes the watchdog can be disabled and reset by grounding the WD_DISX pin. In normal use it can be left floating (internal pull up). Charging is not possible in Power-Off. Connecting a charger during Power-Off generates a rising edge on VCHAR input and the circuit enters Reset mode. Circuit stays in Reset as long as the battery is charged to the limit VBATcoff+. If the watchdog elapses during Power-On when charger is connected, the circuit goes to Power-Off. Because charger detection is level sensitive, charger is detected and the circuit goes via Reset mode to PowerOn mode. In Reset mode the VL and VA outputs are activated by an internal enable signal. The VRX and VTX have external enable inputs VRX_ENA and VTX_ENA. VBATSW and VCHARSW are disabled and PURX is LOW. The circuit leaves the Reset mode after a delay Trd for Power-On if VBAT > VBATcoff+. Watchdog is reset when Power-On mode is entered. The circuit goes into Reset mode from Power-On when the battery voltage VBAT drops below VBATcoff-. 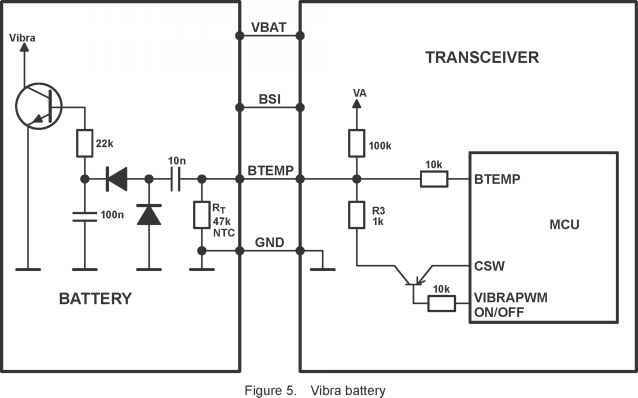 VBAT is monitored internally, hence if voltage VBAT drops below the threshold (determined by internal resistors), transition from Power-on to Reset mode is done. If VBAT doesn't rise back above reset release limit in time Toff the Watchdog elapses and the circuit powers off. To avoid PSA going to RESET mode due to fast transient, transition from Power-On to Reset mode is not done if VBAT is below VBATcoff- for shorter time than threshold detection delay Tdd. The circuit leaves the Reset mode after a delay Trd if VBAT > VBATcoff+. In Power-on mode all the functions are active. VBATSW and VCHARSW outputs are activated by the internal enable signal VSW_ENA. PURX is high in Power-On. From Power-On mode the circuit goes to Power-Off mode after a delay Toff (watchdog delay set by an external capacitor Cosc) if no writing sequence to PWROFFX from logical high level to low level has detected during this time. In Power_on mode the circuit does not react on PWRONX pulse i.e. the circuit must be switched off by the system by not updating the watchdog writing in time Toff. HOW TO SHOW BATTERY TEMP ON SCHEMATIC?